About the book Prayers on my Shelf: Teachers face endless demands and requirements daily, all while trying to meet the expectations of their administrators and parents. It's a rapid-fire profession with no shields or safety net, but spiritual guidance and strength can help. 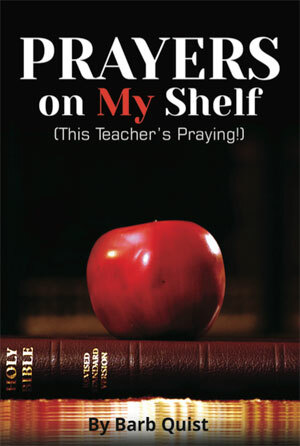 Use the prayers and devotions in this book to enlist help and surrender your classroom. Psalm 105:4 "Look to the Lord and His strength. Seek His face always." About the Author: Barb began her teaching career in a rural farm community in Ohio, but spent 25 years facing the challenges of urban educators. She has had the privilege of growing in faith and being blessed by attending and teaching many Bible studies at Immanuel Lutheran Church in Grand Rapids, Michigan, where she also serves as a Stephen Minister.